You’re not pinning this one on me. Is the work of ISIS. The boxing show in question was organised by MGM (Macklin Gym Marbella) which is the same gym where a boxer was shot in a case of mistaken identity last year. So it was. Mad how time flies. I’ve walked past one of those MGM events at the National Stadium on South circ. road. Serious gaggle of sunbed mutants hanging around outside. Yes. This is, after all, about you. Forget it Mani, it’s Frillytown. Population, Frilly. And Bodger. And Leather Jacket Guy. And Pampers. And that Eurovision loser. And Mani. Limerick was never this bad, in fairness. You’d want to be up in Dublin with a bullet proof vest on.. just to be on the safe side. Why on earth would a crime gang do this? Doing this in such a public manner is just going to draw more media, and therefore, Garda attention. The cops are going to have to go balls out 9/11 to resolve this now. The Guards will be on this 8/5, 227 until they catch these men. They will only rest on their off days and annual leave until these monsters are caught. Aye, if the gang were impersonating Gardaí they’ll treat it very seriously. Never mind the murder. 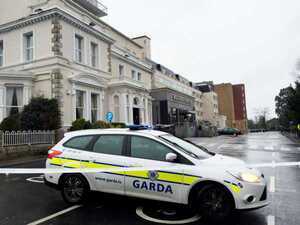 No doubt there would be uproar if garda had shot the gunman dead!! We lucky to be able to put feet up , relax in our sitting room without fear of bullets flying through the window and safely answer the door. These gangland figures might have plenty of dosh but no quality of life. Live by the gun , die by the gun. Anyone up for a pint? I’m shocked,I tell you.Shocked to the core. Did you see the flab on that so-called boxer at the weigh-in ? My oul lade has got more muscle definition on her than him and she’s banged out four kids. Can’t believe Superman just stood there doing nothing. Mid costume change! I’m sorry, I cant help myself, “He, who lives by the sword dies in Swords”. Related, or otherwise to the Spanish thing, I’m sorry for the dead guy’s family. So you’re coming out as a prick publicly on Broadsheet? But don’t worry, you’re still edgy and droll. I sure hope so. I cant help being flippant – I was flippant as you like when my dad (my best friend) died. is the fight doing ahead? No, it’s cancelled, understandably enough.